Data sent from iTunes represents 1.9 percent of North American Internet traffic every night, a share beyond all other competing digital storefronts, but also well behind the bandwidth served up by Netflix. Broadband research company Sandvine has been tracking North American bandwidth usage during primetime hours for years, and its latest data summarized Tuesday by AllThingsD shows that Apple's iTunes is responsible for nearly 2 percent of all Internet traffic at those hours. That places the storefront ahead of websites like Facebook, which accounts for 1.48 percent, and Amazon, which takes 1.31 percent. While iTunes provides video content for purchase or rent, along with music, apps, books and more, it's video-only providers that dominate bandwidth consumption. Netflix alone accounts for 32.25 percent of all nightly downstream traffic delivered over fixed networks to users at home. In second is YouTube, which accounts for 17.11 percent of traffic, placing it ahead of generic "HTTP" data with 11.11 percent. BitTorrent, which is a popular file sharing format for users who pirate copyrighted material, accounts for 5.57 percent of bandwidth used. MPEG video downloads came in fifth with 2.58 percent, placing them ahead of Hulu, which streams TV episodes, movies and its own original content with free and subscription accounts available. Hulu finished ahead of iTunes with 2.41 percent. Apple's iTunes took seventh place among the top bandwidth consuming options with 1.9 percent, placing it just ahead of SSL at 1.89 percent. Rounding out the top services are Flash video (1.72 percent), Facebook (1.48 percent), Amazon (1.31 percent) and HBO Go (0.34 percent). Of the data used by consumers on their home networks, 20 percent was transmitted over Wi-Fi to devices like iPads, iPhones. That's up from 9 percent a year ago. 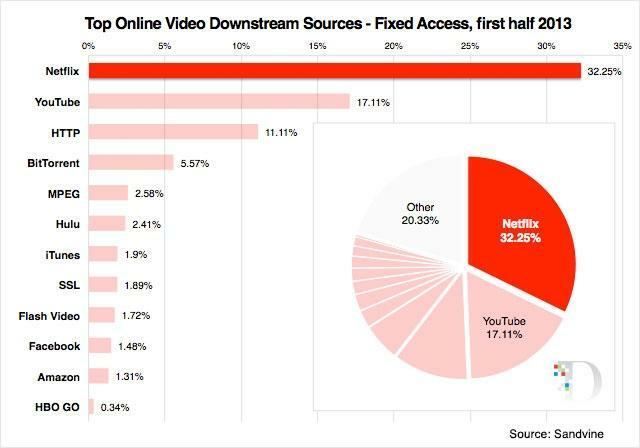 While Netflix is dominant on home fixed network connections, YouTube is the primary bandwidth consumer among mobile data users, taking 27.33 percent.